John and Chris celebrate Star Wars Day with Jenny Miller Pecora (Les Vinyl) at Marie's Gourmet on Staten Island! Listen as they discuss Jenny's job working as a high school guidance counselor, Snapchat, Star Wars, Ghostbusters, sleep apnea, Mid-Evenings with Jay Miller, and more! 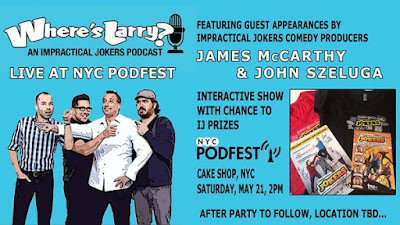 James McCarthy (Impractical Jokers, Reverse Cowboys) joins us for a live show at Staten Island Arts' Culture Lounge in the St. George Ferry Terminal! Big thanks to the Super Secret Show for hosting us. If you're interested in saving Utah, visit gofundme.com/utahthecat.